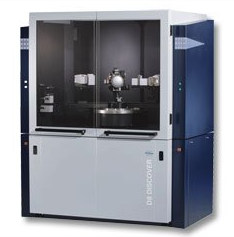 Bruker’s X-ray diffraction portfolio covers a wide range of X-ray scattering techniques for materials characterization and quality control of crystalline or non-crystalline materials such as powders, solid blocks, thin films or liquids. Techniques include X-ray powder diffraction (XRPD), diffuse or “total” scattering (PDF analysis), small angle X-ray scattering (SAXS), thin-film analysis, and X-ray imaging. A unique platform design allows to configure each instrument for a wide range of applications. The functional units of semiconductor and compound-semiconductor devices continuously shrink in size and thickness. Additionally, the structure of the devices becomes more and more complex, the process more and more expensive. Thus, the demand for reliable analytics, such as X-ray diffraction, for process development and at-line or in-line quality control increases permanently. 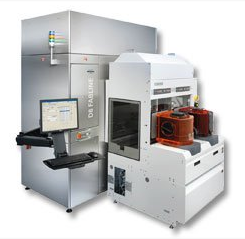 By introducing the D8 FABLINE, the analytical flexibility and reliability – known for the D8 DISCOVER family used in research and development – is now transferred to demanding clean room environments. 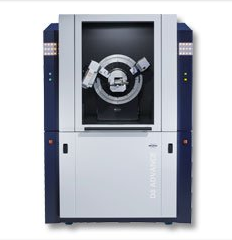 The D8 FABLINE features a robot handling wafers up to 300 mm diameter as well as it can be equipped with two FOUP ports for routine analytics in quality control. Measurements and data analysis can be fully automated and, if required, Bruker AXS supplies the full service to adjust the analytics to the process requirements. Furthermore, SEC/GEM interface can be suited to user requirements, pattern recognition or bar code reading capabilities can be integrated. The D8 DISCOVER with DAVINCI design increases ease-of-use with real-time component detection, plug-and-play functionality and fully integrated 2-dimensional XRD2 capabilities. These unique features allow the user to easily switch between all materials research X-ray diffraction applications, including reflectometry, high-resolution diffraction, in-plane grazing incidence diffraction (IP-GID), small angle X-ray scattering (SAXS), as well as residual stress and texture investigations. The intelligent beam path components of the D8 ADVANCE with DAVINCI design provide true plug’n play functionality requiring minimum or even no user intervention. Featuring automatic and tool-free switching of the diffraction geometry without the need for complex adjustments the D8 ADVANCE with DAVINCI design broadens the analytical capabilities for a wide community of X-ray diffraction users. Together with the ‘Best-Data-Guarantee’ which refers to the ‘Alignment Guarantee’ and ‘Detector Guarantee’ it just means: operating safety assured. The D8 ADVANCE with DAVINCI design comes with the new software DIFFRAC.SUITE. The plug’n play functionality is consistently implemented: any component mounted to the instrument registers itself with its relevant parameters. The DIFFRAC.SUITE offers intuitive operation and the graphical user interface can be customized to match the operator’s requirements, and last but not least features the leading algorithms of its predecessor DIFFRACplus – ease of use assured.